The Chinese People's Liberation Army is putting the finishing touches on its own America's Army-style shooter entitled Mission of Honor. The America's Army franchise has been kicking around for about a decade now, earning kudos and criticism as both a popular multi-platform shooter and one of the most effective Army recruiting tools ever devised. At one point, publisher Ubisoft was actually accused of breaking international law against the recruitment of child soldiers with the game because of its T (Teen) rating. That level of effectiveness may be one reason why the PLA is getting into the game development business itself. 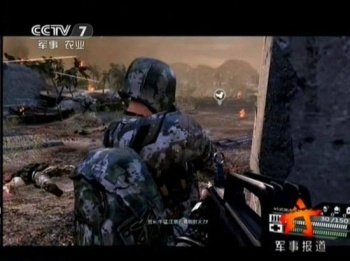 The Chinese Army is currently wrapping up work on Mission of Honor, which it co-created with the Wuxi Giant Interactive Group Inc. Much like America's Army, the Chinese game focuses on life as a military recruit, with three individual modules - basic training, individual mission and team combat - culminating in a final, large-scale drill code-named "Mission of Honor." China Daily says that most of the Chinese military's "entertainment tools" are still simple games like chess and while some military games are occasionally played, they are "mostly developed by foreign countries, which may have different military values and mislead Chinese army officers and soldiers." Soldiers who have tried the new, home-grown game have described it as "quite fun." Mission of Honor is currently being "perfected" by developers. Rumors that the PLA High Command is demanding the inclusion of a zombie survival mode could not be confirmed.